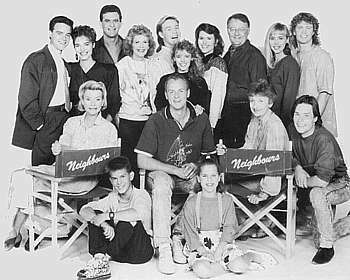 Neighbours cast in 1988: Back row (l to r): Stefan Dennis, Fiona Corke, Paul Keane, Anne Charleston, Jason Donovan, Kylie Minogue, Lisa Armytage, Ian Smith, Annie Jones, Craig McLachlan. Middle row: Anne Haddy, Alan Dale, Vivean Gray, Guy Pearce. Front: Kristian Schmid, Sally Jensen. Neighbours — the longest running drama production on Australian television — was created by Reg Watson of Grundy Television Productions in the early 1980s. Watson was no stranger to devising popular drama, having masterminded a number of other soaps for Grundys, including Prisoner (a.k.a Prisoner Cell Block H) and Sons And Daughters. In its early stages, Neighbours had a number of working titles including One Way Street and Living Together, but the essential premise was the same — the day to day lives of a suburban neighbourhood — loosely based on the neighbourhood of Watson’s own childhood. Neighbours was reportedly offered to the Nine Network who declined in 1982. Though the Seven Network already had a successful drama line-up headed by A Country Practice and Sons And Daughters, the network purchased Neighbours in 1984. The plan was for Neighbours to provide a strong drama-based lead-in to the evening news, emulating a similar strategy employed by Nine in the late 1970s with The Young Doctors. With an initial production budget of $8 million, Neighbours made its debut on Monday 18 March 1985, but from day one it was headed for trouble as the members of the Seven Network — ATN7 Sydney, HSV7 Melbourne, BTQ7 Brisbane and ADS7 Adelaide — ended up slotting the series in different timeslots. HSV7 and ADS7 scheduled it weeknights 6.00pm, leading into the news at 6.30pm. While ATN7, which had their one-hour news at 6.00pm, slotted Neighbours at 5.30pm putting it squarely up against the hugely popular game show Perfect Match – another Grundy production. BTQ7, who delayed their premiere by a week, did the opposite and scheduled it at 7.00pm following their news and current affairs hour. Neighbours enjoyed a solid following in Melbourne where it is produced, and also in Brisbane and Adelaide. However any chance of the show’s survival was dependent on the support of Sydney, which was not forthcoming from the viewers. Then network politics between rivals Sydney and Melbourne got involved, with ATN7 all but withdrawing any support for the series. Having failed to grab a decent audience at 5.30pm, ATN7 then shifted Neighbours to the even less-appealing 3.30pm timeslot, while the other Seven’s maintained their respective timeslots. Despite heavy lobbying by HSV to keep the series, the Seven Network management ultimately put its support behind its Sydney-based dramas A Country Practice and Sons And Daughters, claiming there was no money for a third series. By September 1985, Neighbours was cancelled by Seven after 170 episodes. Despite the cancellation, Grundys executive Ian Holmes still had faith in the concept and then did the unthinkable and offered the series to rival Network Ten. Ten accepted the offer, creating Australian television history as it was the first time a drama series had ever swapped networks. Although Ten had a popular early evening line-up with Perfect Match at 5.30pm and Eyewitness News at 6pm, the network was somewhat let down by re-runs of the US series MASH at 7pm. Ten immediately decided to slot Neighbours into 7pm, hoping to create a strong link between Eyewitness News and the evening schedule. Production for Neighbours began at Ten’s Melbourne studios in Nunawading in November 1985. Conveniently, the real-life neighbourhood (Pin Oak Court) that formed the exterior for ‘Ramsay Street’, was located in the Melbourne suburb of Vermont South, only a short drive away from Nunawading. Following a heavy advertising campaign over the normally quiet summer period, Neighbours made its debut on Ten at 7.00pm on Monday, 20 January 1986. In inheriting the series from Seven, Ten ordered considerable changes to the direction of the series, predominantly in the casting, to reflect a more youthful approach. Joining the cast in the transition to Ten were relatively unknown talents such as Jason Donovan, Guy Pearce, Charlene Fenn, Geoff Paine and later Annie Jones and Craig McLachlan. Also joining the cast were more familiar faces Ally Fowler, previously from Sons And Daughters, Anne Charleston who had just come out of a failed Grundy’s soap Possession, and Vivean Gray, then better known as the gossipy Mrs Jessop from The Sullivans. Then in April 1986, a seventeen-year-old Kylie Minogue, best known from the children’s drama The Henderson Kids, joined Neighbours as tomboy-ish Charlene Mitchell. The romantic pairing of Minogue’s character with Scott Robinson (Jason Donovan) turned out to be the biggest drawcard for the series, creating major hysteria whenever they appeared in public. The wedding of Scott and Charlene in July 1987 became the highest ever rating episode of the series and one of the highest rating soap opera episodes ever in Australia. Also in mid-1987, Minogue recorded a cover version of the 1960s hit Locomotion which was an immediate success and set the precedent for soapie stars to become pop stars — though Minogue remains Neighbours‘ most successful discovery. She left Neighbours in 1988, having won five TV Week Logies, including the Gold Logie, and set out on her new career as an international recording star. Neighbours also proved to be a springboard to international fame for others including Alan Dale, Jason Donovan, Guy Pearce, Natalie Imbruglia, Peter O’Brien, Daniel MacPherson, Holly Valance, Jesse Spencer and Delta Goodrem. In the early months on Ten, Neighbours still struggled to catch on in Sydney while becoming increasingly popular elsewhere. An ongoing campaign to send cast members to Sydney for promotional appearances eventually paid dividends for Ten. The Seven Network could only look on as Neighbours became a huge national success for Ten, until they decided in 1987 to learn from their mistake and have another attempt at an early evening soap — Home And Away. The next step for Grundys was to take Neighbours overseas. By October 1986, Neighbours had secured a low-profile daytime timeslot on the BBC. The perennial sunshine, cheerful characters and leafy streets of suburban Ramsay Street provided a stark contrast to the somewhat gloomier (though still popular) British soaps such as EastEnders and Coronation Street, and viewers became hooked. The increasing problem was that the BBC screened Neighbours in the early afternoons, causing havoc with school attendances as teenagers flocked to TV sets to keep up with the series. Alison Grade, daughter of BBC executive Michael Grade, was an avid Neighbours fan and suggested to her father that Neighbours be moved to an evening timeslot to make it more accessible. In January 1988, Alison got her wish and Neighbours was shifted to 5.30pm weeknights. Within weeks, Neighbours had risen to the top of the British ratings, knocking Coronation Street and EastEnders from the top spot. At its peak in popularity in the United Kingdom, Neighbours was watched by over 20 million viewers, seemingly including members of the British royal family as Neighbours cast members were later invited to appear at a Royal Variety Performance. Almost twenty years after Neighbours‘ BBC debut, British fans continue to make the journey to Melbourne to visit the real-life ‘Ramsay Street’, and the Global Television Studios where the program is produced. The success of Neighbours in the United Kingdom led to the series being sold to as many as 57 countries — including many countries across Europe, Asia and even Africa. The series has been sold to Canada and has also appeared in the United States. Despite the growing popularity of Neighbours overseas, by the early 1990s the series’ popularity was fading in Australia as popular cast members inevitably move on to other ventures. Network Ten was also experiencing its own downfall as ratings overall began to plunge, as did its finances and the network eventually going into receivership. Neighbours was one of the few programs to survive the downfall of Ten, undoubtedly due to the immense overseas support the program had. After a disastrous year in 1990, Ten began to fight back in 1991 with a new programming strategy and a complete image overhaul, targetting the younger 16-39 demographic. Neighbours, and Ten’s other evening soap E Street, became a key component in the revival of the network. In January 1992, Seven decided to move its evening soap Home And Away into the all-important 7pm timeslot up against Neighbours. The result was less than spectacular for both parties as the audience ended up being split between both soaps. By March, Ten moved Neighbours into the 6.30pm timeslot to avoid direct competition from Home And Away and to provide an alternative to current affairs programs on Seven and Nine. The series enjoyed a renewed popularity by the late 1990s sparked by the extra-marital affair of character Dr Karl Kennedy (Alan Fletcher) with his secretary Sarah Beaumont (Nicola Charles). Ratings improved again when Dr Karl’s infidelities surfaced again with a more recent affair with Isabel ‘Izzy’ Hoyland (Natalie Bassingthwaighte). In celebrating Neighbours‘ 20th anniversary, a number of former cast members returned for guest appearances — the most prominent being original cast member Stefan Dennis, who played Paul Robinson from 1985 to 1993, returning for an ongoing period. 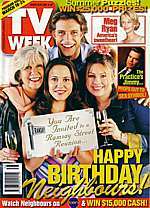 The series has also been acknowledged on its milestone by being entered into the TV Week Logie Awards‘ Hall Of Fame. Although Neighbours was a long-running fixture for the BBC in the United Kingdom, the series changed networks in 2008 when the rights were picked up by commercial broadcaster Channel 5. In 2011 Network Ten made a controversial decision to shift Neighbours from its primary channel to its secondary digital-only channel, Eleven. The move saw Neighbours lose a chunk of its fanbase in Australia, although the series regularly tops the ratings of the digital multi-channels. Now as it approaches its 30th year, Neighbours continues to screen around the world. Fan websites, including detailed episode guides and character profiles, have sprung up online and enjoy a growing popularity (links to some of these sites appear below). The series has won many awards over the years including Logies for Most Popular Drama Series and Gold Logies to cast members Kylie Minogue (1988) and Craig McLachlan (1990). I have been trying to find out when Neighbours is returning to Channel 5, but it has not been possible to find this simple fact out! Will you be kind enough to e-mail the address below with the basic details.